St. John’s United Methodist Church is proud to offer members of the congregation a wide variety of Musical opportunities. Children and Adults are given the chance to participate in musical groups of varying styles and skill levels. Three vocal choirs, a praise band and 4 handbell choirs are available for membership during the year. As a Congregation, we have many things to be thankful for. These past few months were a wonderful example of Talent, Fellowship, Giving and Worship for our Music Ministry. Our clothing drive provided over 150 coats to A Woman's Place in Doylestown. In addition, gloves, hats, socks and scarves were donated. Special thanks to SARAH FLOYD and family for organizing this event. The generosity of our congregation was appreciated. December 9th was a wonderful night of music and celebration at St. John's. Our Choirs, Bell Choirs, Orchestra and Special Groups were FABULOUS. A good time was had by all. We thank Alissa Nelson, and the Villa Joseph Marie HS Choir for their music. Also, Brian Barber, Joe Vettori, Kari Johnson, The Newtown Brass Quintet and Robin Gaul for their contributions to the program. And we can't forget Brian, Matt, Matthew and Kyle for their quartet "singing". EVERYONE enjoyed your performance. As most of you know, our Handbells are 32 years old. With the exception of one of our Bass Bells, all of our bells were donated through the years. We have done an exceptional job of keeping the bells in great shape, with regular maintenance. However, our handles and clappers need to be replaced due to age and cracking. The cost is approximately $2,800. I am please to announce that our offering from the FESTIVAL OF CAROLS was over $2,000, and we will be able to complete stage one of our restoration this summer. THANK YOU ALL for your generosity to our Music Ministry. 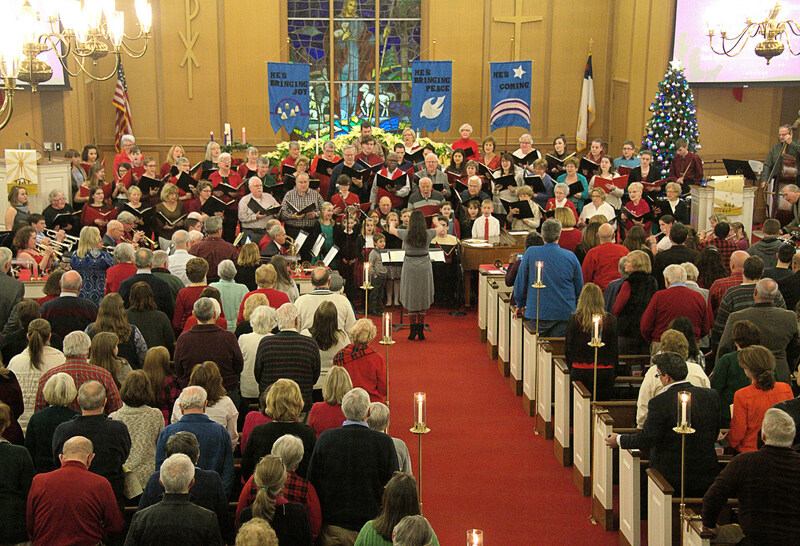 Our December 16th Music Sunday was a great success. Wonderful presentations by our choirs were given to an appreciative congregation. Thank you to all who attended this very meaningful service. All choirs at St. John's are open to anyone, young and old(er) who loves music. There is no formal audition, and your participation in our Music Ministry is welcomed. New members are invited to attend rehearsals as they are listed. Anyone who has a desire to sing or play bells is encouraged to attend. There is no audition or try-out for the choirs. Rehearsals are ongoing Singers and Instrumentalists welcome. The Children’s Choir is designed to give young children, grades K-5, an opportunity to learn singing skills, and to use those skills in the worship service. The Children’s Choir sings in worship once a month, and rehearses each week on Sunday, from 11:30 to 12:15, September through June. The Youth Choir welcomes youth in grades 6-12. The Youth Choir introduces 3 & 4 part singing to the children. The Youth Choir presents a Musical each year, and participates with the Adult Choir on selected Sundays. The Youth Choir sings twice a month at worship, and rehearses each Sunday evening, from 6:00 to 7:00 PM, September through June. The Adult Choir gives adults and post high school youth a chance to sing music of varying styles and levels. The Adult Choir sings at worship every week. Any person who has sung in a choir is welcome to participate. Persons who have not sung, but have an interest are asked to explore membership with the director of music. The Adult Choir rehearses each Thursday evening, from 8- 9:30, September through June. Members of the Praise and Worship Team lead the music at Contemporary Worship each week. Singers and instrumentalists are always welcome and are encouraged to speak to Roy Nelson about membership on the team. The Junior Handbells/Handchimes choir gives an opportunity to younger ringers.The choir is open to children grades 2-5. Also, younger children with musical background (piano lessons etc.) may be eligible to participate in the choir.The choir rehearses on Thursday afternoon from 5:45 to 6:30. Designed for the more advanced youth ringers, this choir uses Handbells, not chimes, and introduces the ringers to a higher level of music and skills. Children from grades 6 and up may join this choir. The choir plays each month in worship. The choir currently rehearses on Tuesdays, from 5:45 – 6:45. This choir is designed for the BEGINNER ADULT; ringer. It gives adults who have no experience with ringing a chance to participate at their own beginning skill level. Some of the ringers have participated for three years, but new members will not feel overwhelmed when they start to ring. Some musical experience is helpful, but not necessary. The choir plays when ready, and rehearses once a month (sometimes twice) usually on the FIRST Monday of the month. Is our ADVANCED adult handbell choir. A wide range of music is performed, using many ringing techniques and skills. Membership in this choir is limited, but interested persons should talk to the director of music for information. The choir plays each month, and rehearses on Thursday nights, from 6:45 – 7:45, September through June. Members of the congregation with previous handbell experience are encouraged to participate in this choir. At this time, there are no openings for members of this choir. If you would like to be considered for a substitute ringer, please contact the Music Director.